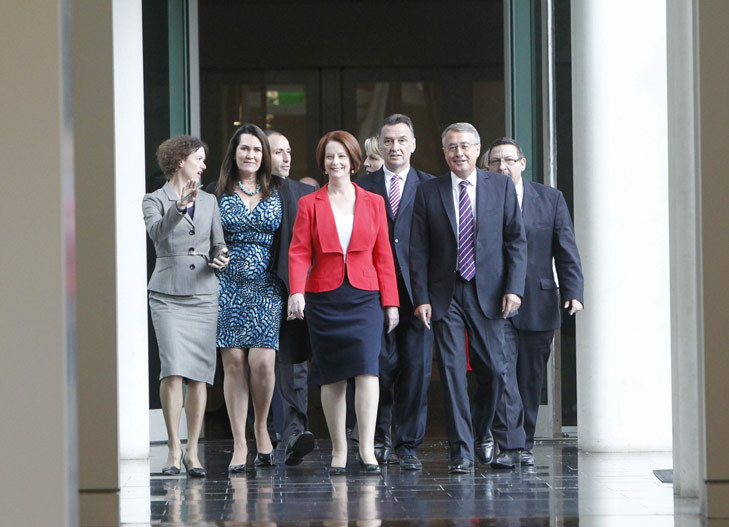 The Prime Minister Julia Gillard with Wayne Swan and iother MP's entered the Labor Party's caucus room to fight for her job as Australia's Prime Minister and the Leader of the Labor Party. THE Labor leadership drama has been hit by a bizarre twist with a recount after reports Julia Gillard had trounced Kevin Rudd by 73 to 29. The margin is slightly higher than expected after some Labor Caucus members were convinced to swap sides and back Ms Gillard. The meeting began at 9am Queensland time. MPs began filing into Caucus early for the vote. Mr Rudd arrived sounded by a group of about 12 supporters including ministers Robert McClelland, Kim Carr, Martin Ferguson and Chris Bowen. The prime minister followed soon after, together with about 10 backers including Wayne Swan, Nicola Roxon, Craig Emerson and Tanya Plibersek. Ms Gillard and Mr Rudd both smiled as they entered the Labor Caucus room, but neither said anything to the crowd of journalists standing in the corridor. NSW backbencher Chris Hayes, who is the returning officer, carried the ballot box into the room. 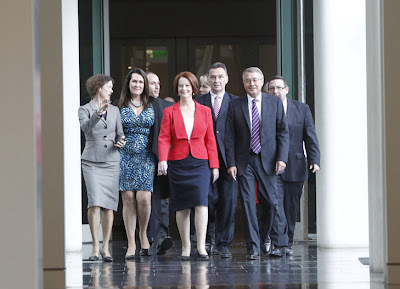 Government whip Joel Fitzgibbon said Ms Gillard would win ``comfortably''. 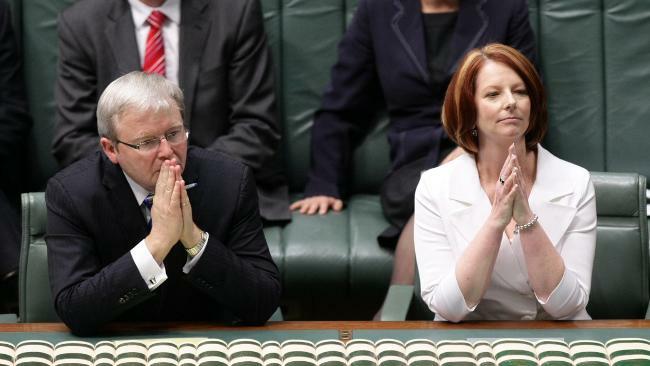 Ms Gillard and Mr Rudd were allowed to address their colleagues both before and after the ballot. Labor MP Michelle Rowland was absent from the ballot because she recently gave birth. Earlier this morning Mr Rudd said he knew the challenge would be difficult. ``It's going to be tough but I'm absolutely confident this is the right course of action,'' he told channel 7. It was the right thing to do to challenge. He added that he would not initiate another challenge against Ms Gillard and that as a backbencher he would have plenty to do. The prime minister's supporters hope her resounding win will help her draw a line under the leadership turmoil that has dogged her ever since she came to power. This is the second time Ms Gillard has defeated Mr Rudd, although it is the first time votes were cast. Mr Rudd did not contest a ballot after Ms Gillard and her supporters abandoned him in June 2010.